Scientists are always rummaging around in the jungles and oceans to rustle up new animal species, but not every addition to the wild kingdom can be as cute as this one. 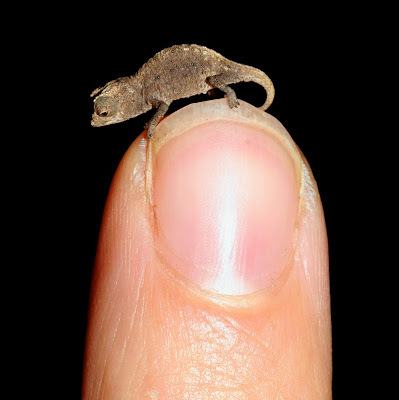 Meet Brookesia micra, discovered lurking around an island in Madagascar — with the utmost tininess, we can only assume. The little chameleon joins the ranks of its newly discovered micro-peer, the respectably minute cowboy frog. Biologists encountered the teensy fella on Nosy Hara, where the species is known to measure up to an average of one inch, from its stubby little lizard nose to the tip of its also quite stubby tail. The micro-chameleon is thought to be a delightful byproduct of a phenomenon known as insular dwarfism, by which a species evolves to become smaller over time in the face of the limited resources of a small ecosystem, like an island. The little lizard takes the honor of being the smallest reptile species in the world. 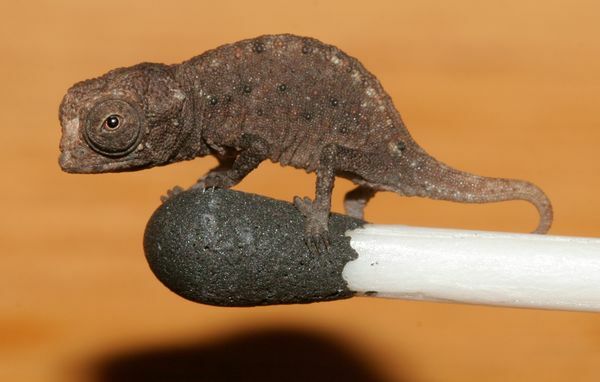 Barely bigger than the head of a match (as you can see), Brookesia micra pushes the limits of just how small a vertebrate animal can get — after all, you've gotta have room for a spinal column, a brain, and peepers in a single teensy serving of critter.